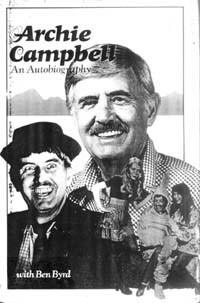 In a way, Archie Campbell's story is also the story of country music and humor on radio and television, for he was one of the pioneers. Archie first went on radio as a country singer in 1936, when radio was still young. He struggled through the days of the Great Depression, when country music was certainly not a very well-paid industry. As soon as television came to Knoxville, Archie had a regular show. From there he went on to national fame as a regular on the Grand Ole Opry and the TV show, "Hee Haw". Archie recalls here his poverty-stricken childhood in the mountains of East Tennessee and his experiences working his way through college. He reminisces about his life on the road as a travelling musician before he broke into radio in Knoxville. His World Ward Two days in the Navy and his wartime marriage are vividly pictured. After the war his steady rise to stardom in radio and television is chronicled with gusto. Reading these memoirs, it's clear that anyone as full of life and as big-hearted as Archie Campbell had to become a star.